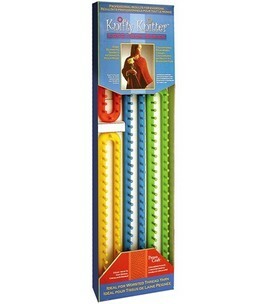 "Make your own knitting loom"
These are the knitting loom people usually start knitting on and can easily be found at any Wal Mart.If you don't have a Wal Mart handy than Joanns has them in stock and will ship right to your door. I do have and use other looms with different gauges. I enjoy them all but mostly I choose to stick with one type of loom gauge so that all can enjoy these patterns. I do have other patterns coming up with different gauges soon. With the Knifty Knitter* looms you usually have to use two strands of yarn or 1 strand of very chunky yarn to have a nicely finished items. 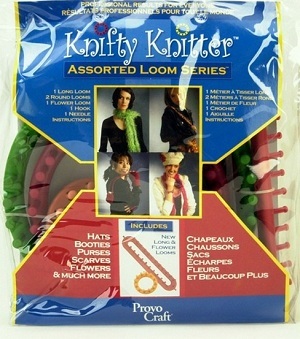 The looms used on these patterns are the round looms, board looms or the 12 peg flower loom by Knifty Knitter. You can of course use any loom with the same gauge. 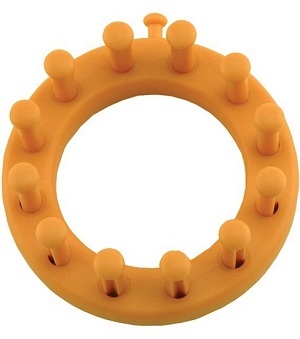 Most board loom patterns can be completed on a round loom as long as you have the proper amount of pegs. When making a flat piece you would not connect on a round loom but would reverse at the end of the row instead of continuing in the round. So I have put together some patters of various items. No rhyme or reason here other than to get you started on more items that can be knit on our large gauge looms. The patterns here are all fairly basic: if you know how to make a hat you should have no trouble with these patterns. There is just enough of a learning curve to keep us interested in advancing our skills. 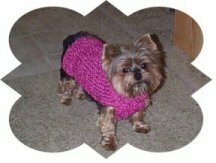 After you have mastered these patterns be sure to add your own imagination and make many different sweaters for your self, the family and even the dog. You will find slippers, booties and hats included. Gifts for baby showers, Christmas, birthdays or just to say I love you. My husband loves when I make him up a new pair of my thick lined slippers. These are my one-piece lined slipper pattern everyone loves. 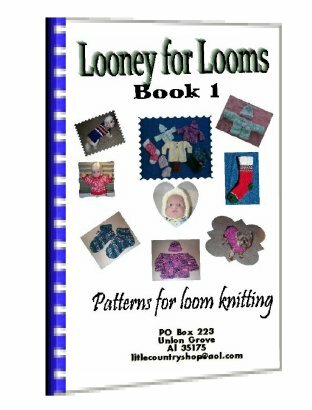 Here are a few of the patterns included in "Looney for Looms" ebook. It is in pdf formatting.